Technically known as blepharoplasty, Dr. Hubbard's Virginia Beach eyelid surgery is a highly delicate, individualized procedure that requires the refined skill and good judgment of an experienced surgeon. 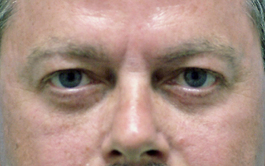 Dr. Thomas Hubbard's interest in this procedure encouraged him to complete additional training in oculoplastic and cosmetic surgery, which involves removing or tightening skin, repositioning or removing fat and adjusting the levels of the upper and lower eyelids. Precise, carefully planned fat injections are also frequently a surgical tool. This procedure is most effective when a surgical plan is uniquely designed for each of our Virginia Beach blepharoplasty patients' personal needs. Dr. Hubbard is highly attuned to the specific demands of eyelid surgery and customizes his approach to each procedure. "I am a healthy active person and eat well, exercise and take care of myself, but I have become frustrated with being told I look tired all the time (which we all know we interpret as 'you look terrible'). After a few years and much thought and research I decided to have Lower Lid Trans-conjunctival Blepharoplasty to my baggy lower eyelids. I am very happy I had this done. My son got married and it was so nice to show up bag free! Overall I am very pleased." Is Eyelid Lift for Me? People who are concerned with sagging or excessively wrinkled upper or lower eyelid skin are often good candidates for eyelid surgery. Those who would like a more defined eyelid crease or who wish to reduce bulges or puffiness in the upper or lower lids may also enjoy the benefits of this procedure. 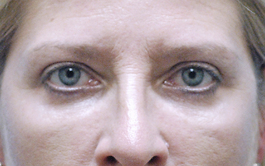 Many patients are not aware that dark circles under their eyes is caused by hollowing. Recent advances in eyelid surgery now allow us to address this concern as well as remove fat bulges and tighten skin when needed. This surgery is done on an outpatient basis usually under general anesthesia or sedation and local anesthesia. The upper lid incision is made where the natural crease should be. The lower lid incision can be made on the inside of the lower lid with no visible scar (transconjunctival). Alternately (or additionally), an incision may be made just beneath the lower lid lashes. Appropriate excess fat and skin is removed and laser resurfacing may be performed at the same time. 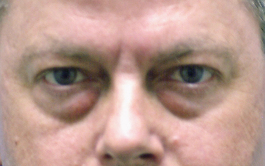 A greater advance is the ability to fill areas of hollow around the eye with the patient's own fat. This dramatically improves "dark circles" which are usually due to hollowing or gaunting. All sutures are usually removed in 5-7 days. Initial mild discomfort is easily controlled with oral medications. Bruising and swelling progressively disappear in 1 to 2 weeks in the majority of patients. Once the sutures are removed, we encourage our patients to visit our skin care clinic for a complimentary makeup session designed to camouflage any remaining discoloration. Contact lenses can be worn when comfortable, usually within 7 to 10 days. 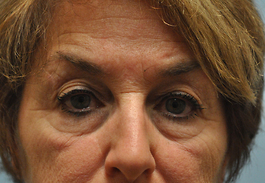 A brow lift can enhance the upper lid alone or with a blepharoplasty. Fat injections alone or in combination with other facial procedures are a great way to correct a gaunt look or hollowing under the eyes. A face lift with fat injections to the cheeks also can enhance the lower lid area in more subtle ways. 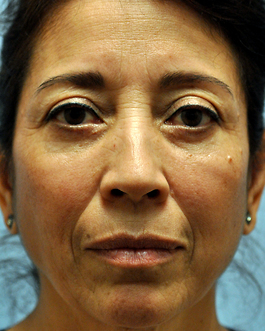 State-of-the-art lower eyelid surgery has safer, more natural rejuvenated results these days with recently advanced surgical techniques. 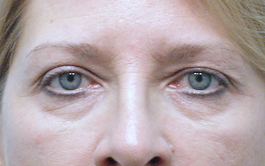 Blepharoplasty has undergone great advances from even 5 to 10 years ago. There are many more and sometimes even better options than just removing skin and fat. In fact, no 2 blepharoplasties are exactly the same since the process must begin with very careful analysis of each patient's needs. Recovery varies with the techniques used. 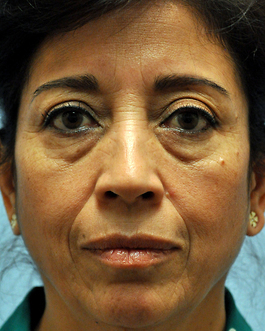 Some blepharoplasty patients can still return to work in 7 days. Some techniques such as correcting a malar bag on the cheek will require a longer recovery. It's important to be careful when comparing before and after photos. Our photo gallery pictures show special shadow views, intended to simulate the everyday light that we live in. Care was taken not to use artificial bright frontal light (which is used in most medical photography) since that would blanch out or hide many wrinkles and shadows. The dramatic rejuvenation shown is a direct result of careful surgical planning and the implementation of many different techniques to achieve our best possible outcome. Modern lower lid blepharoplasty or eyelid tuck procedures have taken quite a step forward in effectiveness and degree of rejuvenation with the addition of fat injections. Many signs of aging in the lower lid are due to hollowing. In fact, in some individuals, the only sign of aging in the lower lid is hollowing with no excess skin or bulging fat. 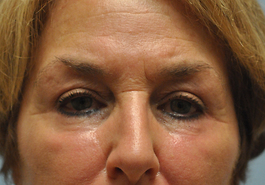 Please visit our photo gallery page to see additional examples of eyelid surgery. To learn more about arguably the best eyelid surgery Virginia Beach has to offer, schedule your consultation today.